The Hunt Library hosts a display of the Virtual Paul’s Cross project for special guests, including the chairman of the National Endowment for the Humanities. Photos by Becky Kirkland. 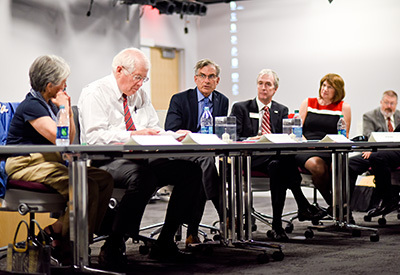 It remains unclear if Friday’s visit by National Endowment for the Humanities Chairman William Adams was the first to NC State by a sitting NEH chairman, but it is clear that NC State faculty and administrators hope it won’t be the last. 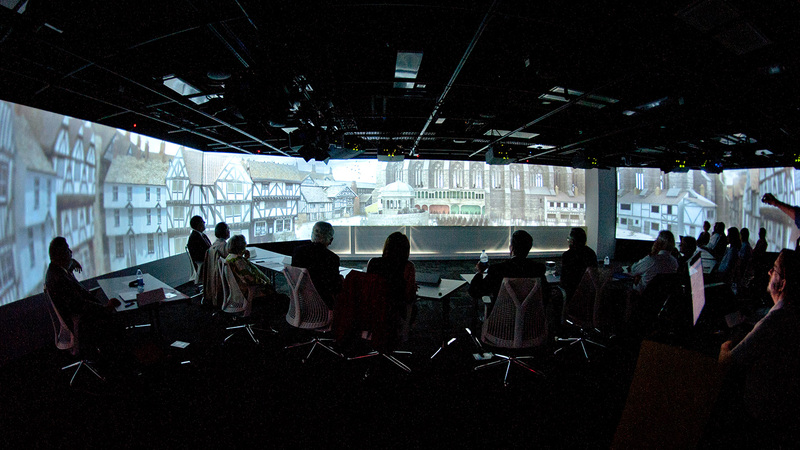 While learning more about the university’s digital humanities projects in the Hunt Library’s Teaching and Visualization Lab, Adams surprised about two dozen digital humanities scholars and supporters by announcing a new $324,135 grant to NC State to fund the next phase of a particularly successful digital humanities project – a visual and acoustical model of St. Paul’s Cathedral. 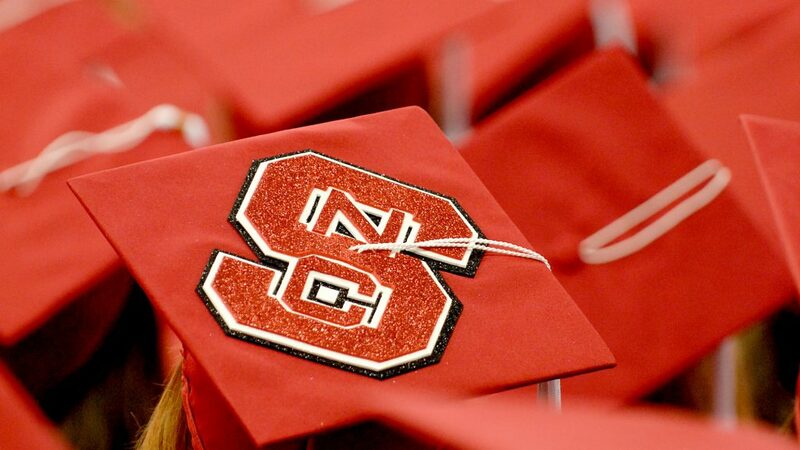 The award is the largest NEH grant in NC State history. NEH Chairman William Adams (right) and N.C. Rep. David Price discuss the digital humanities at NC State. The new grant continues work supported by a 2011 Digital Humanities Start-Up Grant of $49,998 from NEH that underwrote the creation of a 3-D model of the cathedral’s outdoor pulpit called Paul’s Cross as it would have appeared in the early 17th century, prior to the 1666 Great Fire of London that destroyed the original church. The project team, led by English professor John Wall and design professor David Hill, staged a performance of John Donne’s Nov. 5, 1622 Gunpowder Day sermon featuring a voice actor experienced in the dialect of early modern London. Using acoustical models, they recreated how the sermon would have sounded with different numbers of spectators standing in different locations within St. Paul’s Churchyard. The funding, which runs from January 2016 to December 2018, will extend the 3-D model to encompass the interior of St. Paul’s Cathedral. 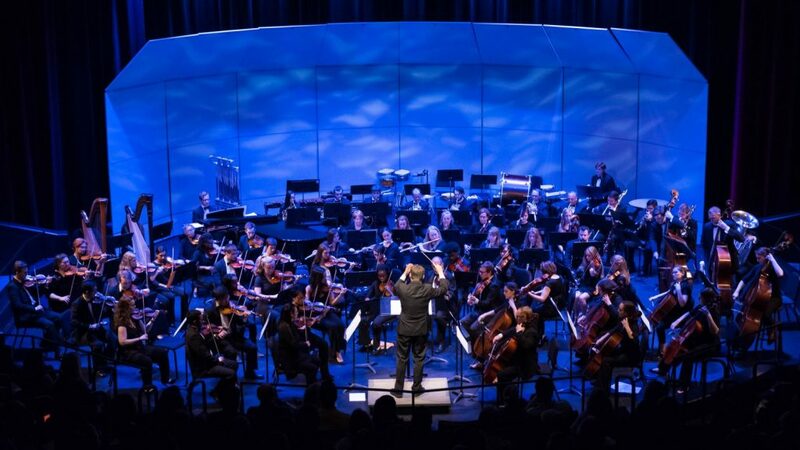 It will also develop openly available acoustical modeling software that other scholars could use to analyze historical models of a variety of sites from different eras. Recently, Wall and Hill expanded their interdisciplinary team by joining with Assistant Professor Yun Jing in the College of Engineering. Jing, who holds a Ph.D. in architectural acoustics, will enable the team to complete their digital model of St Paul’s Cathedral and to recreate worship services held inside the cathedral, including choral and organ music composed by musicians at the cathedral in the early 1600s. Last week’s event highlighted NC State’s work as a global leader in the emerging field of the digital humanities. 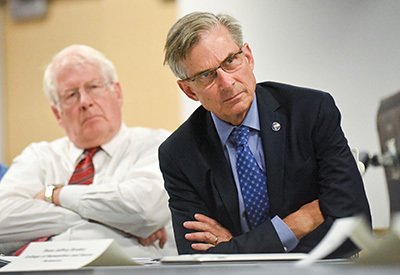 Adams visited NC State along with N.C. Rep. David Price. “The humanities in many ways are anchored in lived experience,” Adams said, “which is why they are so important and so irreplaceable. To see this project, which is so much about that dimension of things, is to me enormously impressive. I think some of the most exciting things happening in the humanities are happening in the digital humanities space. “John (Wall) mentioned his hope that the Endowment will continue to fund this work – and we will,” Adams said to applause from the crowd as Wall and Hill beamed. “We hope you come again soon,” quipped Jeff Braden, the dean of humanities and social sciences, after Adams announced the gift. In addition to the Paul’s Cross project, Adams and Price learned about several digital humanities projects at NC State. Communications professor Victoria Gallagher and doctoral student Keon Pettiway explained the Virtual MLK Project, which recreates Martin Luther King’s historic “Fill Up the Jails” speech of Feb. 16, 1960. English professor Tony Harrison presented Victoria’s Lost Pavilion, a virtual reconstruction of Queen Victoria’s Buckingham Palace garden pavilion, a Victorian time capsule encompassing a variety of artistic styles, influences and critical conversations. English professor Timothy Stinson spoke about the Medieval Electronic Scholarly Alliance that organizes the federation of digital projects in the field of medieval studies and provides peer review of electronic scholarship in the field. He also described the Piers Plowman Electronic Archive, a collaborative open-access project that provides access to the complex textual tradition of Piers Plowman, a 14th-century poem surviving in more than 50 manuscript copies. History professor Matthew Booker and computer science professor Michael Young shared information about the recently approved visual narrative faculty cluster at NC State, an interdisciplinary program that applies the ancient humanities tool of narrative to the modern technical problem of overwhelming quantities of visual data. Designers, engineers and humanists will collaborate to unlock the potential of visual information.